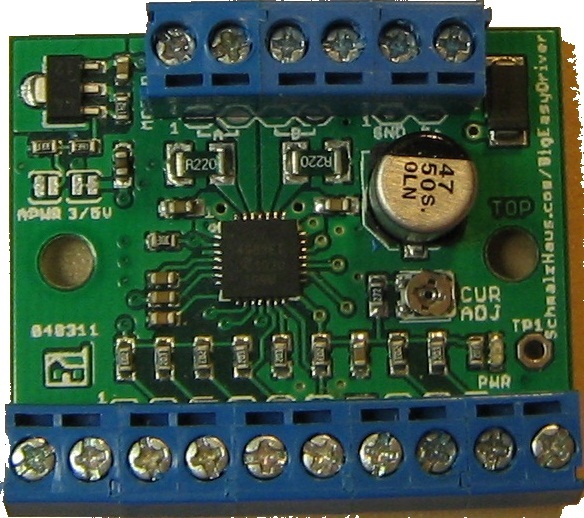 The Big Easy Driver is a stepper motor driver board for bi-polar stepper motors up to 2A/phase. It is based on the Allegro A4983 or A4988 stepper driver chip. 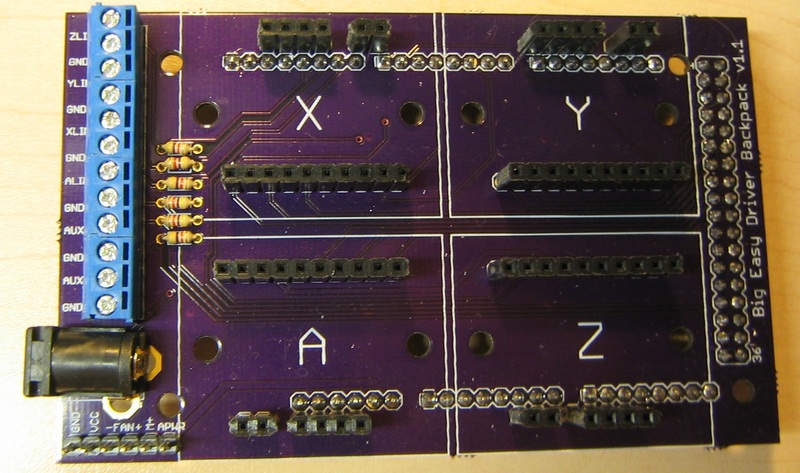 It is the next version of the Easy Driver board. Download the latest version of the Big Easy Driver user manual here. Each BigEasyDriver (BED) can drive up to about 2A per phase of a bi-polar stepper motor. It defaults to 16 step microstepping mode. (So if your motor is 200 full steps per revolution, you would get 3200 steps/rev using the Big Easy Driver.) 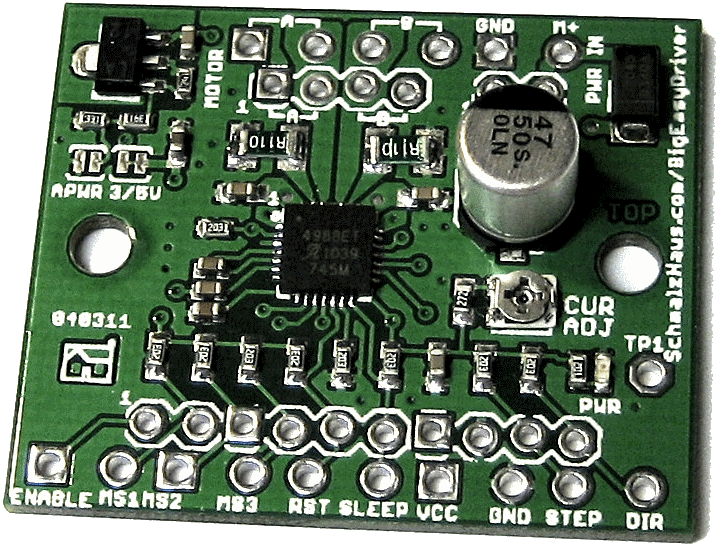 It is a chopper microstepping driver based on the Allegro A4988 driver chip. For the complete specs of the design, read the A4988 datasheet. It has a variable max current from about 0mA/phase to 2A/phase, although I have tested it to 2.2A/phase with a heatsink and/or fan. It can take a maximum motor drive voltage of around 35V, and includes on-board 5V/3.3V regulation, so only one supply is necessary. GND : There are three GND (Ground) pins on the Big Easy Driver. They are all connected together inside the board. Connect the negative side of your power supply, as well as from any other boards you are using to drive the Easy Driver to one or more of the GND pins. 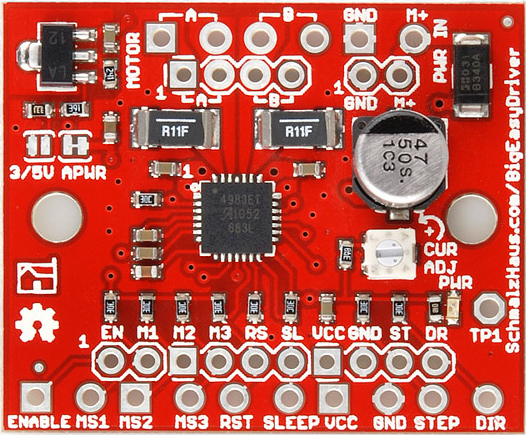 M+ : This is the power input to the Easy Driver. Connect this to the positive power supply lead. This should be a 6V to 30V, 3A (or more) power supply that is clean (low ripple). STEP : This needs to be a 0V to 5V (or 0V to 3.3V if you've set your Big Easy Driver that way) digital signal. Each rising edge of this signal will cause one step (or microstep) to be taken. DIR (Direction) : This needs to be a 0V to 5V (or 0V to 3.3V if you've set your Big Easy Driver up that way) digital signal. The level if this signal (high/low) is sampled on each rising edge of STEP to determine which direction to take the step (or microstep). That's it - those are the only signals that you absolutely need to connect to anything. All the rest below are optional - in other words, the Big Easy Driver sets them to reasonable default values. MS1/MS2/MS3 : These digital inputs control the microstepping mode. Possible settings are (MS1/MS2) : full step (0,0), half step (1,0), 1/4 step (0,1), and 1/8 step (1,1 : default). SLEEP : This normally high input signal will minimize power consumption by disabling internal circuitry and the output drivers when pulled low. EN (enable) : This normally low input signal will disable all outputs when pulled high. VCC : This is an OUTPUT pin that will provide either 5V (default) or 3.3V from the voltage regulator, at a small amount of current (say 50mA - depends on input voltage) to power a circuit that you may need powered. I do not sell Big Easy Driver boards. This design is being released into the general public just like the Easy Driver design. Anybody can take the design presented on this page and do anything they want with it. I'm providing Eagle schematic and board layouts as well as a Bill Of Materials and instructions on how to build and use the design. If you do decide to manufacture the Big Easy Driver for yourself or for sale, please remember that royalties are the only way that I can continue to provide support to Easy Driver users, so contact me. (11/04/12) Added a link in FAQ section below to (Big) Easy Driver Example page - how to use your Big Easy Driver with an Arduino or chipKIT board! (6/19/11) Files published on this webpage - schematic, board layout, BOM, etc. (5/17/11) Initial webpage created. More content to be filled in after Maker Faire. BigEasyDriver V1.0 - Initial version. Tried to keep similar board footprint to EasyDriver - not cool. Routing didn't work well, heat dissipation didn't work well. Forgot pull-up resistors on digital inputs. BigEasyDriver V1.1 - New form factor, got all of the EE stuff right. Great power dissipation, works very well. BigEasyDriver V1.2 - Minor changes - silk screen cleanup, sense resistors now 0.11 ohms, minor layout tweaks, and R13 is now 2.49K. First SparkFun production version. Q1) Do I need a heatsink on that little chip? A) Probably not. Most of the time, you will be able to get perfectly acceptable performance without running all the way up to 2A/phase. Even without a heatsink, you will be able to get close to 2A/phase. If, however, your BEDs will be enclosed, or in high ambient temps, or you really want to push them (I've gotten to 2.2A/phase with heatsink and fan) then I recommend this little guy: A FISCHER ELEKTRONIK 34M6428. The board is designed for maximum heat dissipation, so its really good at getting rid of the heat even without the heatsink. Q2) The datasheet for the driver chip shows that the motor connects to pins OUT1A, OUT1B, OUT2A and OUT2B, and the diagram in the datasheet has one coil connected across OUT1A and OUT1B, and the other across OUT2A and OUT2B. But the Big Easy Driver only has A, A, B, B for motor connections, and it looks like one coil should be connected across the two A pins and the other across the two B pins. What's up with that? A) Yeah. Ooops. Clearly that was a pretty bad choice for the Big Easy Driver labels. On a bi-polar stepper motor, there are four wires that connect to two coils. Each coils has two wires. The Big Easy Driver calls those two coils A and B. So one coils' wires are to be connected across the two A pins, and the other coils' wires are to be connected across the B pins. The driver chip datasheet refers to these two coils as coil 1 and coil 2. Sorry for the confusion. See the diagram below for the accurate connection diagram for the Big Easy Driver. Q3) So if I can't trust the silk screen, how do I know which way to turn the CUR ADJ pot to set the current in my stepper motor to some value? A) Well, there are two methods. One is to run your motor at a nice constant speed, say 500 steps/s, and slowly and carefully turn the current adjustment pot one way or the other (careful not to go past the mechanical end stops if the pot you have has them) and listen, feel, and watch the motor. There will normally be a place in the pot's range that produces smooth microstep action and minimizes the 'buzz' of the motor as it moves. That's probably a good place to leave it. Where Itripmax is the current that the driver will allow through to the motor coil, Vref is the TP1 voltage, and Rs is the value of the current sense resistor, which is .11 Ohms for the current BED. So if you have 0.0V at for Vref, then the max current will be (theoretically) 0A. And if you have Vref maxed out at 3.8V, then the (theoretical) current will be 4.3A. Now, you clearly can't get 4.3A/phase out of the BED. So the maximum usable range will probably be in the 0V to 1.76V (results in 2A/phase). Depending on if you have a heatsink, fan, low impedance motor, etc. 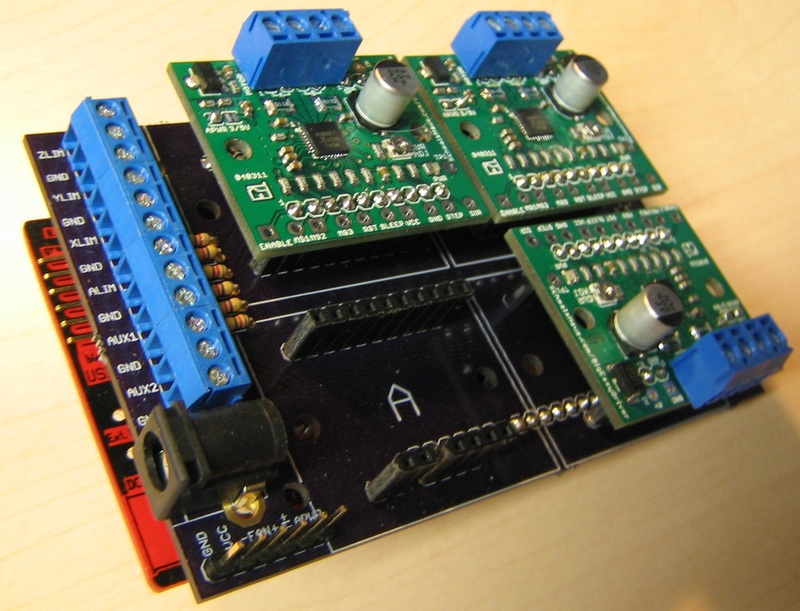 Q4) Do you have any examples of how to use the Big Easy Driver with an Arduino or chipKIT board? A) Yes! Check out this page - everything there for the Easy Driver applies to the Big Easy Driver. Q5) Does it matter which order I power things on? Can the Big Easy Driver be damaged by the order that things power up? A) As far as I know, no. If you have a microcontroller board (like a chipKIT or Arduino) connected to your Big Easy Driver, and the microcontroller is powered from a different power supply than the BED is (say over USB from a PC), it might seem to make sense that powering up the microcontroller first would apply voltages to the Big Easy Driver pins before the BED is ready for them (since it isn't powered up yet) and cause damage. Based on my understanding of the input protection circuitry on the BED, and my extensive testing, there should be no damage caused in this situation. This answer only applies to the order in which power is applied to the boards - you still must not disconnect a motor from a BED that has power. Here's a drawing on one way to hook up a six wire stepper motor to the EasyDriver. For Maker Faire San Mateo 2011 I threw together a quick Arduino shield that could hold four Big Easy Drivers - I called it the Big Easy Driver Backpack. This ran for 2 days straight, running my little Fireball mill. I ran GRBL on the Divolino Arduino board and streamed G-code to it from a custom written Libery Basic application. Based on a work at www.schmalzhaus.com/BigEasyDriver. Permissions beyond the scope of this license may be available at www.schmalzhaus.com/BigEasyDriver.